Among that first generation of Pixar masterpieces, Monsters Inc. may not occupy as sacred a spot as the heartbreaking Toy Story films or the epic Finding Nemo. But it’s probably the Pixar film I’ve watched the most, and having seen it again pretty recently, I can confirm that it’s lost none of its zip, its wit, or its adorable sense of fun; the film’s door chase near the end through the Monsters Inc. factory might still be the most explosively inventive climax of the entire Pixar canon. Enough of that original spirit remains in the new Monsters University that it’d be absurd not to recommend it. But you could be forgiven at times for wondering, Is that all there is? even as you’re being charmed. A prequel to the earlier film (since Inc. ended by beautifully undoing its own conceit, thus making the prospect of a sequel problematic), Monsters University is again set in Monstropolis, the land that lies beyond the terrifying closet doors of our childhood nightmares, where monsters of all shapes and sizes go about their daily business. The new film traces our heroes from the earlier one — gentle, horned behemoth James “Sulley” Sullivan (John Goodman) and pedantic walking green eyeball Mike Wazowski (Billy Crystal, who still sounds so young) — back to when they first met in college. 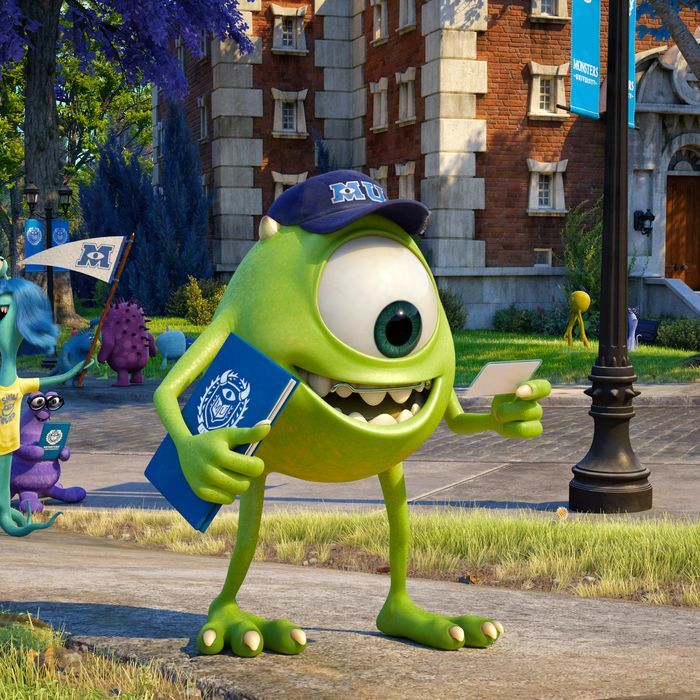 Though a bit more impressionable at this point, Mike is already an ambitious, nerdy know-it-all, while Sulley is the physically gifted, though unfocused, offspring of a legendary alumnus and “scarer.” The school itself is basically a feeder for Monsters, Inc., where the lucky few will one day get jobs on the “Scare Floor,” heroically harvesting the screams of terrified human children to use as an energy source for Monstropolis. Most of the film concerns the efforts of Mike and Sulley as they attempt to win the Scare Games, a competition among the school’s fraternities and sororities to find out who’s the best scarer of them all. Unfortunately, they’re stuck with the school’s lamest fraternity, Oozma Kappa, and seem destined to lose. Can they instill a sense of unity and a can-do spirit among their ragtag frat brothers in time to win the contest? If that plot description sounds sort of familiar, that’s because it’s basically the exact same setup as the Vince Vaughn–Owen Wilson vehicle The Internship that came out two weeks ago — right down to the rival team with the stuck-up leader who likes to taunt our heroes, and the tough-but-fair administrative overseer of the whole contest. At heart, of course, these are all variations on Revenge of the Nerds and God knows how many other underdog stories. This certainly wouldn’t be the first time Pixar has borrowed a well-worn template from an earlier movie: The wondrous A Bug’s Life is The Seven Samurai with insects, and Cars is Doc Hollywood with cars. But execution matters. Verve, and energy, and inventiveness matter. And Monsters University is funny, fast, and likable, with occasional moments of real visual surprise and laugh-out-loud offhand gags: A schlumpy school librarian turns into a looming, horrific mountain of evil upon hearing loud noises in her library; a sweet monster mom rolls up the car windows to be alone with her “tunes,” which turn out to be death metal; a mild-mannered freshman struggles to learn the true value of his tentacles. But much of this is low-hanging fruit — milking the brilliant conceit of the original movie for all it’s worth. Call it the harsh bigotry of insanely high expectations, but it’s hard not to feel a little let down by Monsters University. Perhaps only Pixar could give us such a rare beast: a delightful disappointment.